A former policeman is to be charged with murdering a man who was shot dead after a car was stopped by officers in north London nine years ago. Azelle Rodney, 24, was travelling in a car that was stopped by police, who were looking for a group they believed were on their way to an armed robbery. An inquiry last year chaired by Sir Christopher Holland ruled there was "no lawful justification" for the shooting. The CPS has now made a decision to charge the man, identified only as E7. The former police marksman will appear at Westminster Magistrates' Court for a preliminary hearing on 10 September. 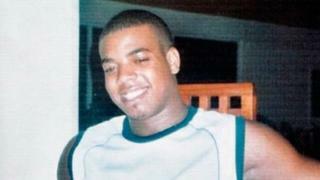 Mr Rodney was shot six times - in the arm, back and head - in Edgware in April 2005. He was travelling with two other men when officers stopped the car and opened fire. His mother Susan Alexander said: "I am very pleased at the CPS's decision to prosecute the officer who killed my son. "I have waited a long time to see this day and hope this prosecution will lead to justice for Azelle. "Whilst I am disappointed at the decision not to prosecute the commissioner in relation to the failures which were found by Sir Christopher Holland regarding the planning and control of the operation, his report makes clear that there were significant failures on the part of the Metropolitan Police and we deserve an immediate and unreserved apology for those failures." Director of Public Prosecutions Alison Saunders said: "Following the outcome of the public inquiry, the Independent Police Complaints Commission re-referred the matter to the CPS, providing us with the evidence previously gathered and the further evidence and material which has emerged since the initial referral. "We have carefully considered the new file of evidence submitted to us and have decided that a former Metropolitan Police officer, currently identified only as E7, will be prosecuted for murder." The Met said in a statement: "As criminal proceedings are now active, it would be inappropriate to comment further on this case at this time. "Our officers are highly-trained and professional and fire shots only once or twice a year. We accept that where this happens, our officers will be subject to detailed scrutiny. "We keep our firearms tactics constantly under review and have accepted the recommendations made by the public inquiry into Azelle Rodney's death." Giving his reaction, the national police lead for armed policing, Deputy Chief Constable Simon Chesterman tweeted: "Carrying a gun on behalf of the State is a big ask that just got bigger. Justice will prevail. #armedpolice."